No, I'm not moving - reckon I have far too much 'stuff' for that to be straightforward!! I was sorting out my box of cards and realised there were a few gaps which needed filling so for now I'm concentrating on those categories rather than making loads of birthday cards. 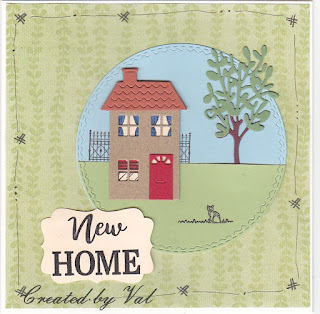 This new Home card gave me an opportunity to make use of a die and stamp set which came free with a recent magazine. Since we lost the bus service which I used regularly I don't get to the larger newsagent so often which means I miss out on the temptation to pick up magazines with freebies but I'm pleased I didn't miss this one. The house was cut using the die supplied and then I drew lightly in pencil through the windows onto a scrap of cream card so that I could then use some of the stamps to add curtains and blinds to make the house appear lived in. The railings behind the house, the little cat sitting on the grass and of course the sentiment were all included, along with others, in the stamp set. The tree was cut using another die which I've had for a while and wasn't part of the set although there is a tree stamp which could be used another time. what a very super card and I love that wonderful scene it's so brilliantly created. My that was a lovely way to use that freebi die you should enter that in the magazine. You created a beautiful scene, my friend. The house is awesome and I love the tree! Kisses. A wonderful scene Val, your free die looks great. I know just what you mean about moving, I've far to much clutter (craft supplies) to even think about it. Tee hee Val! Hubby and I were discussing earlier how we are going to cope with down-sizing one day. The answer being to start sorting out all the things we no longer need and find them new homes!! Then hubby finished by saying "but I'm not ready to leave here yet! .. .. which really meant he couldn't be bothered to sort though everything! LOL!! 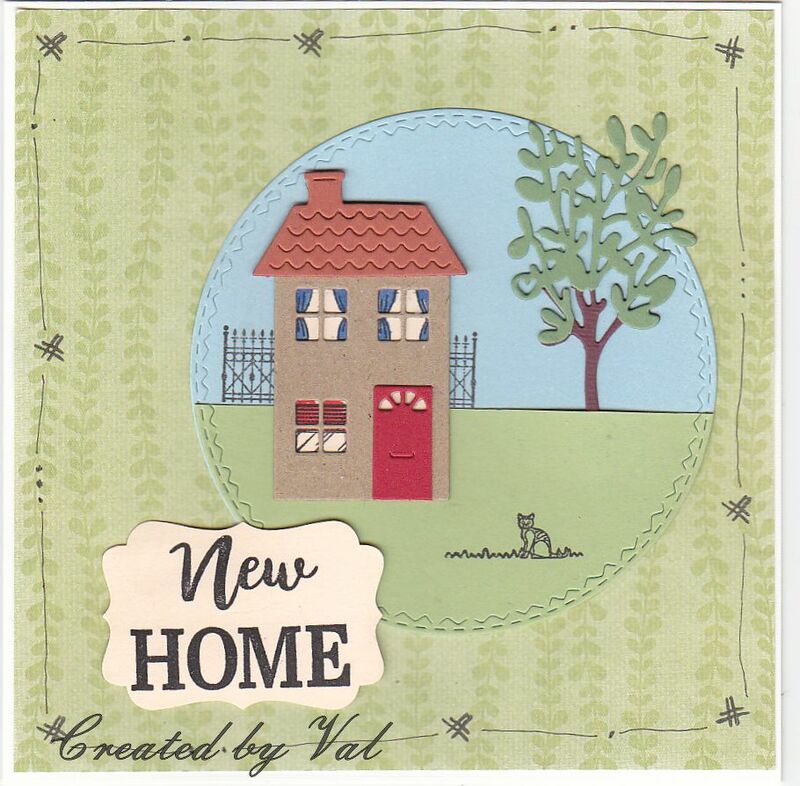 Loving your new home card. A great little scene.